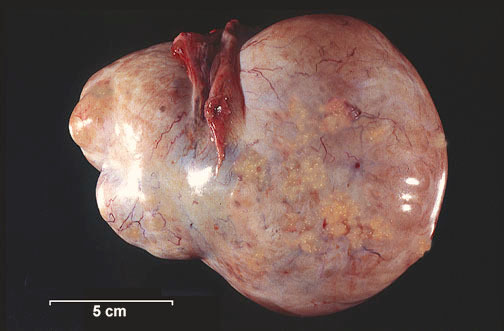 This ovarian papillary cystadenocarcinoma is mostly composed of solid tissue and has invaded outside of the ovary, with papillations seen over the surface. There are often no early signs or symptoms with masses in the ovary, so that many of these ovarian tumors have metastasized by the time they are detected with abdominal enlargement. These neoplasms characteristically spread by "seeding" along peritoneal surfaces.